Things may be heating up outside, but that doesn't mean you have to ditch your ankle booties entirely in favor of flip flops. 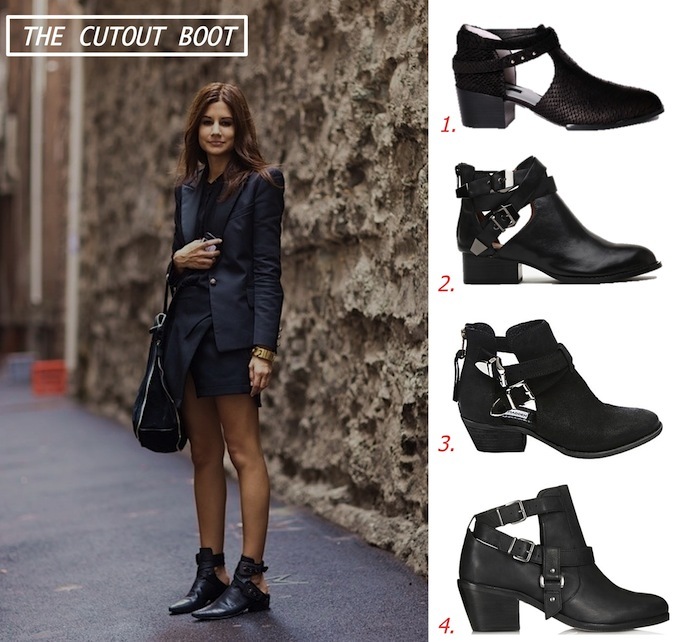 Cutout boots offer an edgy vibe with plenty of foot support while still being a bit airy. Wear them now with a sundress while exploring new cities and then in fall pair them with a tailored suit and chunky knit when it gets cool outside. Cutout boots have been making the rounds on the cool kids, including Nicole Richie and Miley Cyrus, who have been spotted wearing Balenciaga Cutout Buckle Boots. Equally lust worthy and almost as pricey are Alexander Wang's designs. But have no fear if you would rather save your paycheck, there are wallet friendly and inspired booties out there waiting for you. The Everly cutout boot from Jeffrey Campbell is a new closet staple but I also love Senso's mint bootie which is perfect for summer. If you don't have a cutout boot in your shoe repertoire yet, it is time to start shopping! These will surely see you through the summer and step into next fall with style. Totally loving this shoe trend. There's a pair of Alexander Wang's that I'm dying for. All of them looks nice ! The cut out boot is so chic right now. somehow i totally missed seeing this trend. i think these are fabulous! Love this short boot look! I'm so tempted to buy the JC pair!! Why did you have to remind me how much I need a pair of cutout boots in my life??! Love this look < and the boots are stunning . Love it! I really love the second pair. It's perrfect: modern but casual at the same time. Wear them now with a sundress while exploring new cities women's tan boots and then in fall pair them with a tailored suit and chunky knit when it gets cool outside.